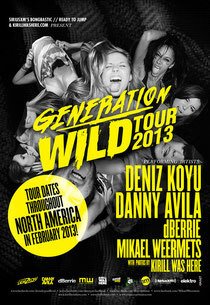 17 year-old Spanish DJ, Danny Avila, recently announced his next venture – The Generation Wild Tour! Featuring four young DJs and producers - Danny Avila, Deniz Koyu, dBerrie and Mikael Weermets - joining forces from all over the world, this concept tour kick-starts at The MID in Chicago on January 31. Taking in 19 shows in less than a month, with more dates to be announced soon, the whole experience will be documented by live music photographer, Kirillwashere.